If you could find out whether your newborn baby is at risk of developing treatable early-onset genetic diseases, would you want to know? A recent poll, commissioned by Sema4 and conducted online by Harris Poll, found that nine out of ten Americans would want this knowledge. Similarly, 87% of Americans said that they would likely request a supplemental non-invasive DNA test if their state’s newborn screening panel test did not cover many of the treatable conditions that could affect a child in their first years of life. 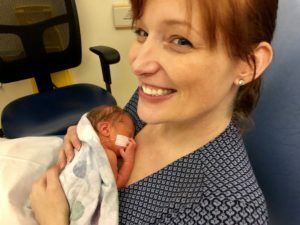 I recently sat down with two new moms who did just that, ordering Sema4 Natalis, our new supplemental newborn screening test which screens for 193 early onset genetic diseases – around five times the number tested for on a typical state-mandated “heel prick” screen – all of which are treatable. The test also includes a genetic analysis of how a child is likely to respond to 38 medications commonly prescribed during childhood. This pharmacogenetic information can help pediatricians personalize treatment for a child and avoid adverse effects or incorrect doses of drugs, including antibiotics. Once a physician has approved the order on the basis of answers to a brief medical survey, the Natalis kit is sent out in the mail so that DNA samples can be collected at home. A gentle cheek swab is used to obtain the DNA, a procedure that’s easy on the babies and the parents. “Eva didn’t mind; we didn’t mind. It was a very easy process,” said Michelle. “I’ve never done an at-home DNA test, so it was totally foreign, but it couldn’t have been easier. The instructions were very clear.” Kathryn’s son, Asher, was also completely onboard with the genetic sampling going on in his mouth: “He thought it was a pacifier,” she joked. While neither baby’s disease screen indicated the need for further action, the results of the accompanying pharmacogenetic screen gave the moms useful, actionable information on how their children would respond to a variety of medications commonly prescribed during the early years. 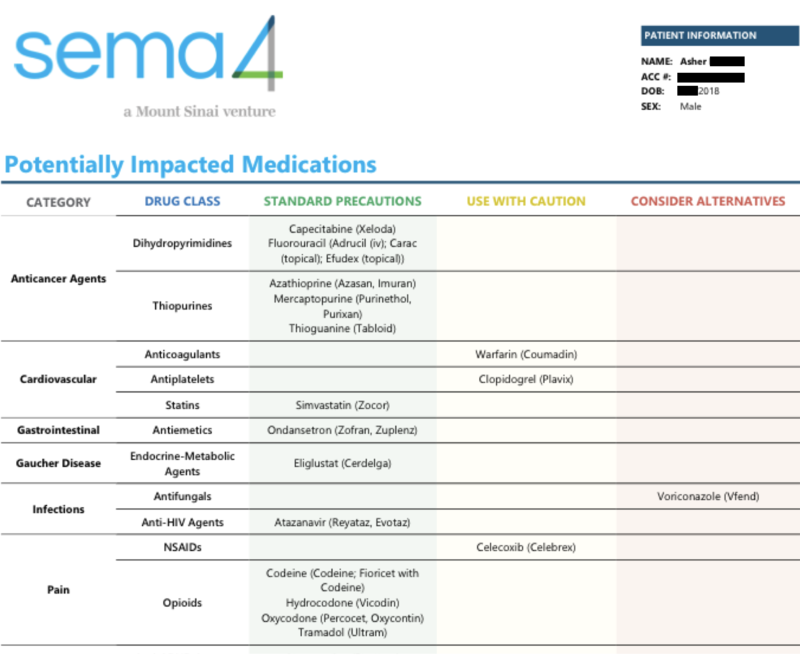 The medication report provides descriptions of what the different drugs are and how they are used, outlines how the child is likely to respond to each, and includes a summary that a parent can print out to give to their child’s pediatrician, as well as keeping in his or her wallet. 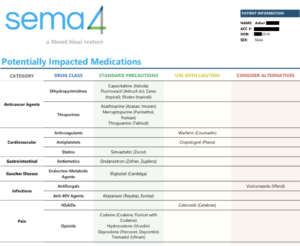 In addition to providing information on which drugs should be used with caution or, if possible, avoided, the medication screen also lets parents know which medications can be used with just standard precautions. Eva, for example, is predicted to respond normally to thiopurines, a class of anticancer drugs, as is Asher. This information will be valuable to them and their pediatricians growing up, should they ever need these medications. 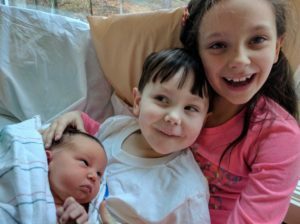 Kathryn would like to see supplemental newborn screening, like that provided by Natalis, become increasingly common “for diseases that are treatable. For the minimum amount of effort, you can actually get results that are actionable. That makes a big difference,” she told me. Kathryn and Michelle were provided access to Natalis free of charge.